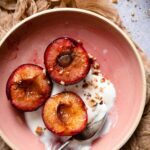 Roasted Plums are simple to make and a great addition to breakfast or dessert recipes. Plus they taste fabulous all by themselves. 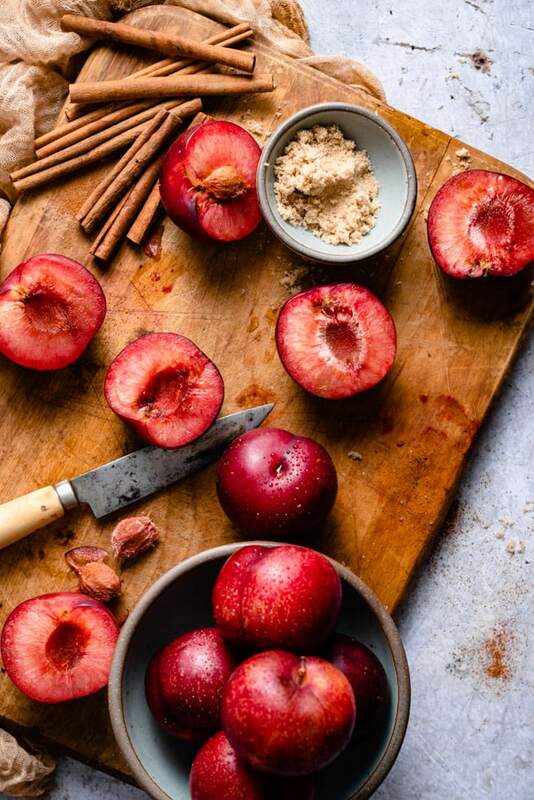 All you need are plums, brown sugar, cinnamon and honey! Your whole house will smell amazing, way better than a store bought candle. If you have friends coming over for a fall get together, pop these babies in the oven. 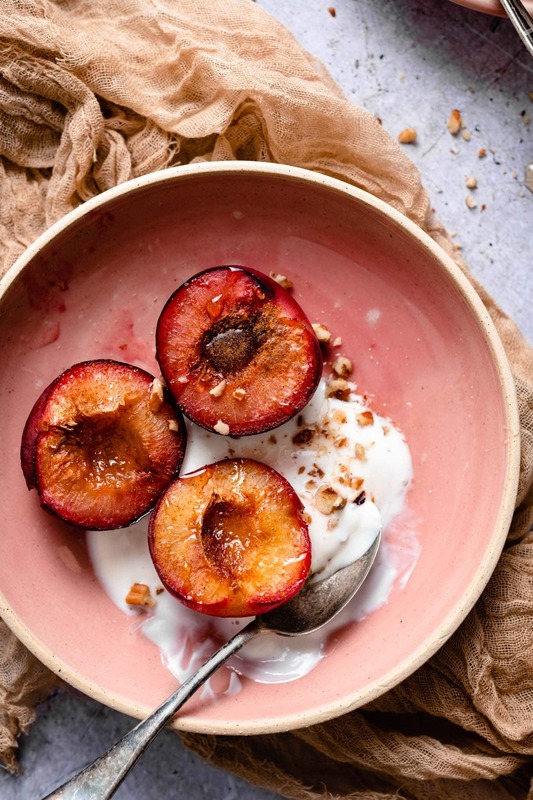 Add them to your morning yogurt or late night ice cream with a drizzle of caramel sauce. Serve as a side dish or pair with a spiced cocktail. Win, win!! Any Plum variety will do. Choose your favorite ripe plums. Wash the skins, slice in half and remove pits. When you slice your plums, place knife halfway through until you reach the pit. Twist the plum in a circle, to cut evenly around the plum towards the pit. Then gently grab both halves with your hands and twist each half in the opposite direction. The halves should separate into two equal portions. Take a spoon and pop out the pit. Use a casserole dish or deep baking tray. Place sliced side up and sprinkle with brown sugar and cinnamon. You can add nutmeg or pumpkin spice as well! Drizzle with honey and bake! If your a maple syrup fan, use it in place of honey. Bake on the bottom shelf to prevent burning. Plums are ready when their skin begins to wilt and darken around the edges. Serve with greek yogurt, a sprinkle of your favorite nuts and drizzle with extra honey! 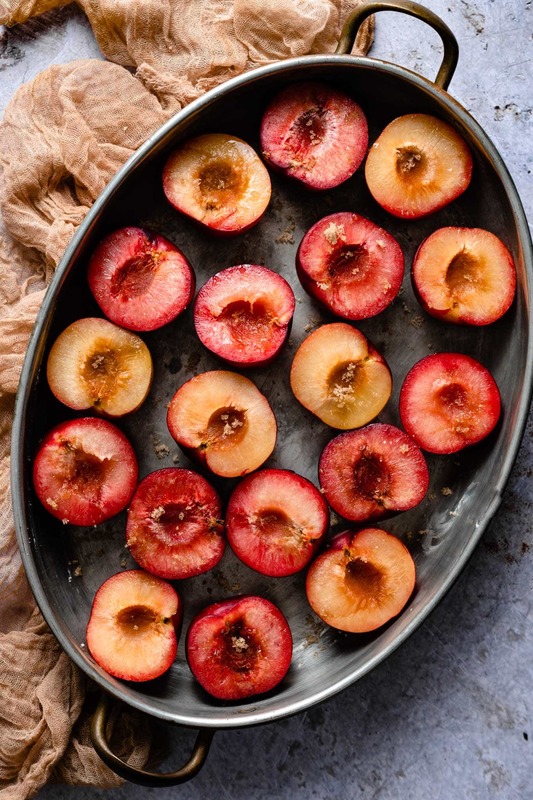 Allow your roasted plums to cool completely. Then remove their skins. 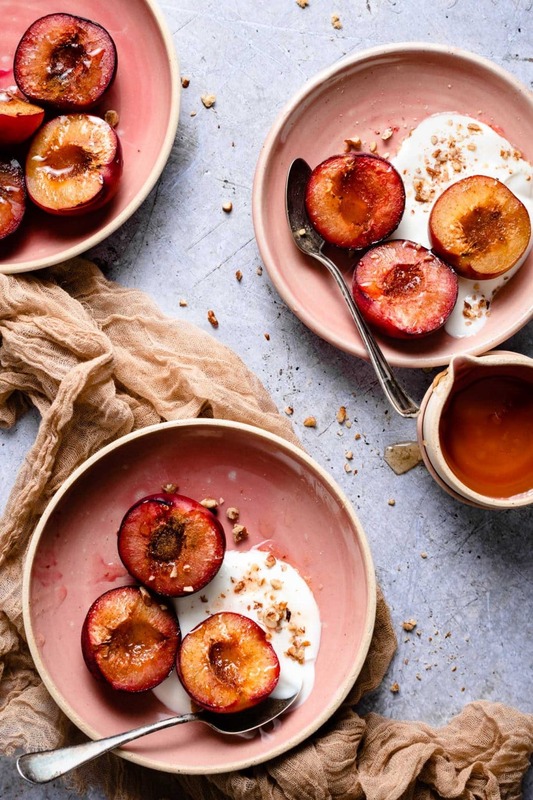 Place peeled roasted plums in a blender or food processor and pulse until smooth. Add additional honey or cinnamon to taste. 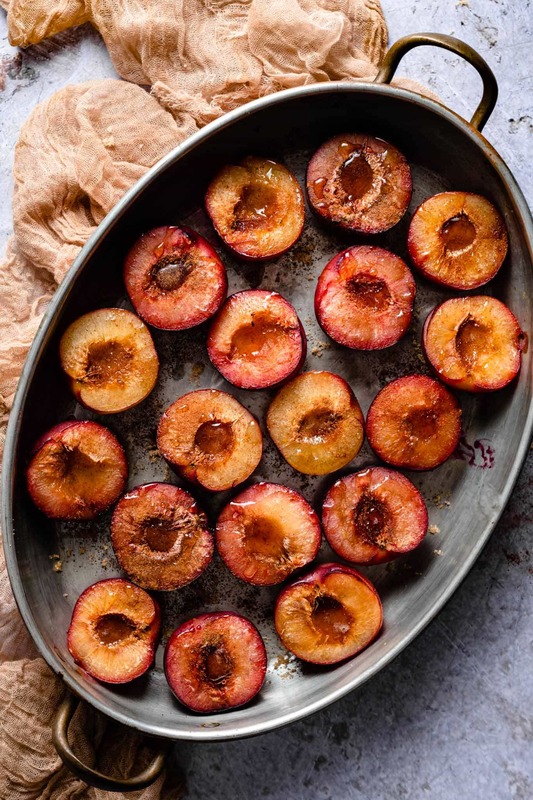 Roasted Plums Recipe with brown sugar, cinnamon, and honey. Served with greek yogurt or ice cream. Details for Roasted Plum Puree. Take Butter and rub across surface of baking dish or tray. Place plum halves sliced side up in baking dish. Bake plums on bottom rack for 20-25 minutes until edges of skin begin to wilt and darken. Plums should be soft. Remove tray from oven and let cool for 5 minutes before serving. 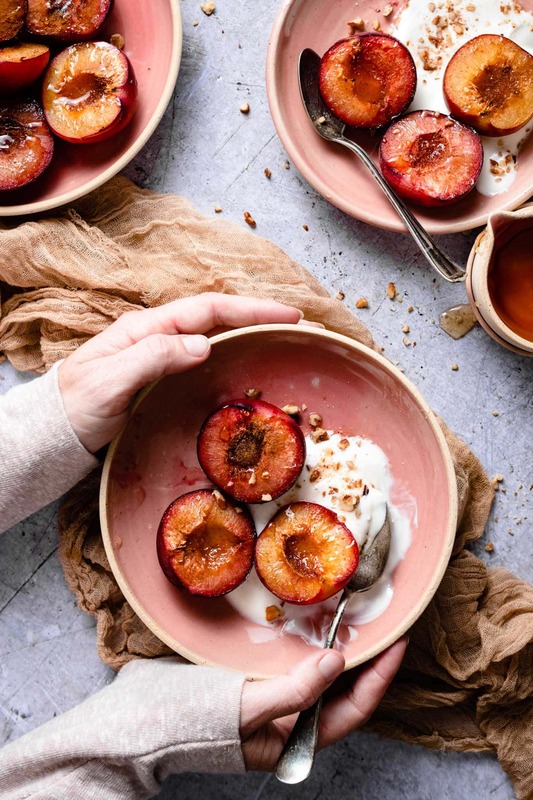 Place roasted plums on greek yogurt, sprinkle with nuts, and a drizzle of honey! After plums have completely cooled, peel off skin. 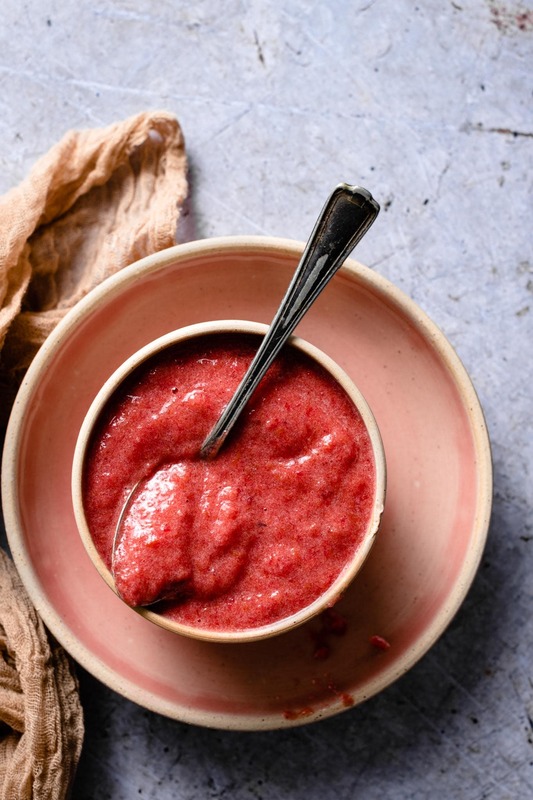 Place plums in blender or food processor and pulse until smooth. Add additional honey or cinnamon to taste! Use puree in baked goods to replace applesauce or mix with ice cream!